Text: Crying at a movie is my second nature. As soon as an event occurs which is the least bit sad my throat chokes up and very often I shed tears; I have never sobbed or made boisterous noises, thank goodness, for crying is a chief source of embarrassment with me; if I can get by with silent sorrow I feel all right. One of the saddest pictures I ever saw was Hardy’s novel “Tess of D’Urbervilles” dramatized on the screen. I took that so hard and lived through Tess’ part so real that I was embarrassed to go out on the street with my eyes all red and swollen. For that reason I do not enjoy a sad picture; it usually makes me miserable. Likewise “Way Down East,” “Ramona,” and “The Hunchback of Notre Dame” afforded me heartaches. I do not merely cry, but it seems I actually feel the pain as acutely as the actor himself. “Sorrel and Son” affected me so strangely that I cried over it the next day. Try as I might to control my tears I cannot, and I certainly do not find pleasure in crying. 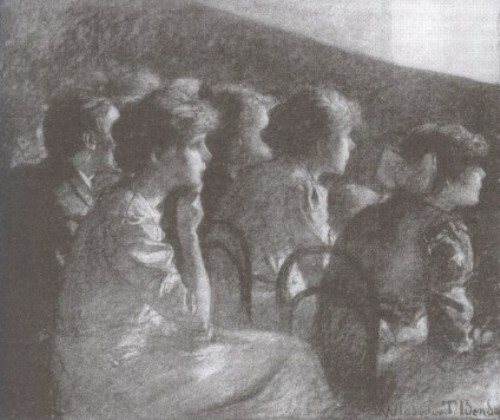 Comments: American sociologist Herbert Blumer’s Movies and Conduct presents twelve studies of the influence of motion pictures upon the young, made by the Committee on Educational Research of the Payne Fund, at the request of the National Committee for the Study of Social Values in Motion Pictures. The study solicited autobiographical essays, mostly from undergraduate students of the University of Chicago, and presented extracts from this evidence in the text. This extract comes from the section ‘Emotional Possession: Sorrow and Pathos’. The films mentioned are Tess of the D’Urbervilles (USA 1924). Way Down East (USA 1920), Ramona (USA 1928) and Sorrell and Son (USA 1927). This entry was posted in 1920s, Reports and studies, USA and tagged Crying, Performers, Ramona (1928), Sorrell and Son (1927), Tess of the D'Urbervilles (1924), Way Down East (1920). Bookmark the permalink.